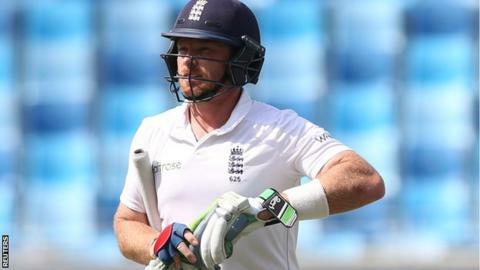 England must change their batting line-up after the collapse on day three of the second Test against Pakistan, according to Geoffrey Boycott. Ian Bell has made three fifties in his last 19 innings, Jos Buttler averages 13 over seven Tests and Moeen Ali is being used as a makeshift opener. "The selectors have to find an opening batsman and change Bell and Buttler," former opener Boycott told BBC Sport. "For me, James Taylor would have played all three Tests against Pakistan." After drawing the first Test in Abu Dhabi, England were well placed after two days in Dubai, reaching 182-3 in reply to Pakistan's 378. But they lost their last seven wickets for 36 runs to be bowled out for 242 and then saw Pakistan move to 222-3, a lead of 358. "It's a professional game, you have to perform," said Boycott, who made 8,114 runs in 108 Tests for England. "Somehow the desire isn't there. I'm not enjoying saying it but there are too many collapses and too much onus on the bowlers to win the Test matches." Nottinghamshire's Taylor has not played a Test since winning two caps in 2012, but has impressed in the one-day side, including making a century against Australia in September. "The time to play people is when they're playing well and his form is excellent, he got a lovely hundred against Australia in the one-dayer at Old Trafford," said Boycott. "A good coach would have said 'young man you're going to play all three Test matches, don't worry about just one innings, we'll give you a fair go and see how you do.'" Wicketkeeper Buttler has not made a Test fifty in his last 11 innings and has scored only 27 runs in his three knocks against Pakistan. Bell made a century against West Indies in April, but since then has passed 30 on only three occasions. "Bell has got an average of 19 in 20 innings, and as much as I love his batting when he's playing well, you can't go on like that," Boycott said. "Buttler is the same, he looks a shadow of the guy that plays lots of shots in one-day cricket." If both Bell and Buttler are left out for the third Test in Sharjah, Jonny Bairstow could take the wicketkeeping gloves, making room for both Taylor and his county colleague Alex Hales, who lost out to Moeen in the battle to partner Alastair Cook at the top of the order. Moeen has scored 47 runs in three innings after being promoted from number eight, where he batted for all but one of his eight innings in the Ashes and averaged 36. "They have no opening batsman," Boycott said. "You've got a stop-gap in Moeen, which I think is putting a round peg in a square hole. "He's not an opening batsman. The kid played really well in the Ashes series down at number eight, where he is free to play shots against the old ball. "He got some wonderful runs for us. He takes the attack to the opposition when they think they've got through you. "But up top he's not defensively tight enough. He doesn't score, he's just stuck and he doesn't know whether to stick or twist, it's not fair to put him there."